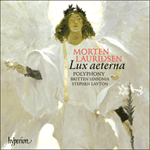 O magnum mysterium is pervaded by the same tenderness and refinement found in Lux aeterna; indeed, this refulgent work was written in 1994, just before Lauridsen began to contemplate the composition of the larger score. 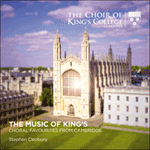 The composer has disclosed that this motet is an ‘affirmation of God’s grace to the meek—a quiet song of profound inner joy’. With a text from Christmas Matins that has been set by such disparate composers as Victoria and Poulenc, Lauridsen’s O magnum mysterium expresses mystical awe at the mystery of the Incarnation as well as the very human tenderness of the Virgin Mary for her newborn child. O magnum mysterium est envahi de la même tendresse et du même raffinement que Lux aeterna—ce resplendissant motet fut d’ailleurs écrit en 1994, juste avant que Lauridsen n’envisage la composition du vaste Lux aeterna. Le compositeur a révélé que O magnum mysterium est une «affirmation de la grâce de Dieu envers les doux … un paisible chant d’une profonde joie intime». 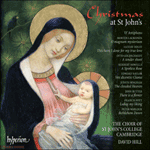 Reposant sur un texte des matines de Noël déjà mis en musique par des compositeurs aussi divers que Victoria et Poulenc, O magnum mysterium de Lauridsen dit la crainte mystique face au mystère de l’Incarnation, mais aussi la tendresse toute humaine de la Vierge Marie pour son enfant nouveau-né. In O magnum mysterium herrscht dieselbe Zartheit und Finesse wie in Lux aeterna vor; und tatsächlich entstand dieses strahlende Stück 1994, kurz bevor Lauridsen es in Erwägung zog, ein größeres Werk zu komponieren. Der Komponist hat darauf hingewiesen, dass diese Motette eine „Bestätigung der Gnade Gottes gegenüber den Sanftmütigen ist—ein ruhiges Lied von tiefgehendem innerlichen Glück“. 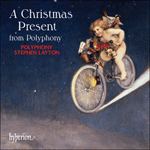 Der Text stammt aus der Weihnachtsmatutin und ist von den verschiedensten Komponisten, darunter Victoria und Poulenc, vertont worden; Lauridsens O magnum mysterium drückt eine mystische Ehrfurcht vor dem Wunder der Inkarnation und auch der sehr menschlichen Zärtlichkeit der Jungfrau Maria für ihr neugeborenes Kind aus. to bear the Lord Christ. Alleluia! de porter le Seigneur Christ. Alléluia! Christus den Herrn zu tragen. Alleluia! 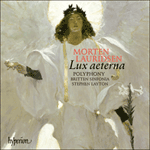 It was with the setting of the Christmas Matins text O magnum mysterium that the American composer, Morten Lauridsen (born 1943) gained an international reputation. 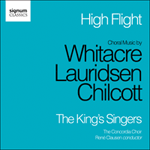 The premiere was given in 1994 by the Los Angeles Master Chorale at the beginning of Lauridsen’s association with them as their composer-in-residence. Among his best-known works are his other a cappella motets Ave Maria and Ubi caritas, as well as the larger-scale Lux aeterna. Composers over the centuries, notably Victoria and Lassus, have been drawn to the words of O magnum mysterium which depict, in Lauridsen’s words, ‘the birth of the new-born King amongst the lowly animals and shepherds’. 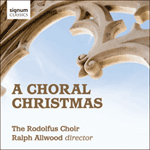 Lauridsen continues: ‘This affirmation of God’s grace to the meek and the adoration of the Blessed Virgin are celebrated in my setting through a quiet song of profound inner joy.’ In its serene but purposeful progress, the music captures the awe and wonder of the mystery of the Incarnation. 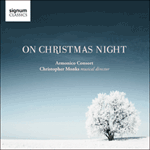 Ce fut le motet des matines de Noël O magnum mysterium qui valut au compositeur américain Morten Lauridsen (né en 1943) sa réputation internationale. La Los Angeles Master Chorale le créa en 1994, au début de son association avec Lauridsen, alors son compositeur en résidence. Parmi les œuvres les plus célèbres de cet artiste figurent les motets a cappella Ave Maria et Ubi caritas, sans oublier Lux aeterna, à plus grande échelle. Au fil des siècles, les compositeurs, notamment Victoria et Lassus, ont été attirés par le texte de O magnum mysterium qui, selon Lauridsen, dépeint «la naissance du Roi nouveau-né parmi les humbles animaux et bergers». Il poursuit: «Cette affirmation de la grâce de Dieu envers les doux et l’adoration de la Sainte Vierge sont célébrées, dans ma mise en musique, par le chant paisible d’une profonde joie intime.» Dans sa progression sereine mais résolue, la musique saisit la crainte et l’émerveillement du mystère de l’Incarnation. Der amerikanische Komponist Morten Lauridsen (geb. 1943) schuf sich mit seiner hier vorgestellten Motette O magnum mysterium einen internationalen Ruf. Der Text stammt aus der Morgenliturgie am Weihnachtstag. Die Uraufführung von Lauridsens Vertonung fand 1994 durch den Chor Los Angeles Master Chorale statt. Damals stand Lauridsen als Komponist-in-residence am Anfang seiner Zusammenarbeit mit diesem Chor. Zu Lauridsens bekanntesten Werken zählen seine anderen Motetten a cappella, Ave Maria und Ubi caritas, sowie sein groß angelegtes Lux aeterna. Über die Jahrhunderte hinweg fühlten sich viele Komponisten, allen voran Victoria und Lassus, von den Worten des O magnum mysterium angezogen. In Lauridsens Worten beschreibt der Text: „die Geburt des neugeborenen Königs unter den bescheidenen Tieren und Hirten“. Lauridsen fährt fort: „Diese Bestätigung von Gottes Gnade für die Frommen und die Anbetung der Heiligen Jungfrau werden in meiner Vertonung durch ein leises Lied von profunder innerer Freude gefeiert“. Die Musik fängt in ihrem gelassenen aber zielgerichteten Verlauf die Erfurcht und das Erstaunen über das Mysterium der Menschwerdung ein.